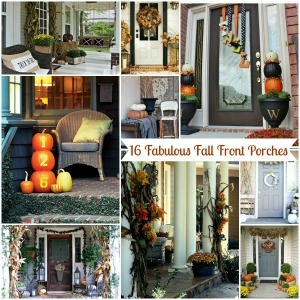 Happy Fall Y’all! The weather here in Georgia has finally taken a turn for the cooler side, which is a very welcome thing after a hot summer. 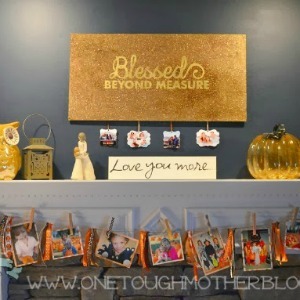 The inside of my house is decorated for fall, and I thought the outside could use a little fall flair as well! I created a festive mailbox decor, and I’m anxious to show you how simple it can be to dress up your own mailbox for fall! I kind of wish I had a “before” picture of this mailbox area in our yard, but secretly, it was so gross I’m glad I have no evidence. Ever since we moved in two years ago, there’s been this humongous bush wrapped around our mailbox, and it’s been growing slowly. I was seriously worried that it might eat our mailman one day. Finally, just a couple weeks ago, I was hanging out with the hubs in the garage, and decided to cut that bad boy to pieces. (The bush…not the hubs.) And we were left with…DIRT! Glorious dirt! Y’all, I was so glad to see that bush gone that I didn’t even mind the dirt spot. 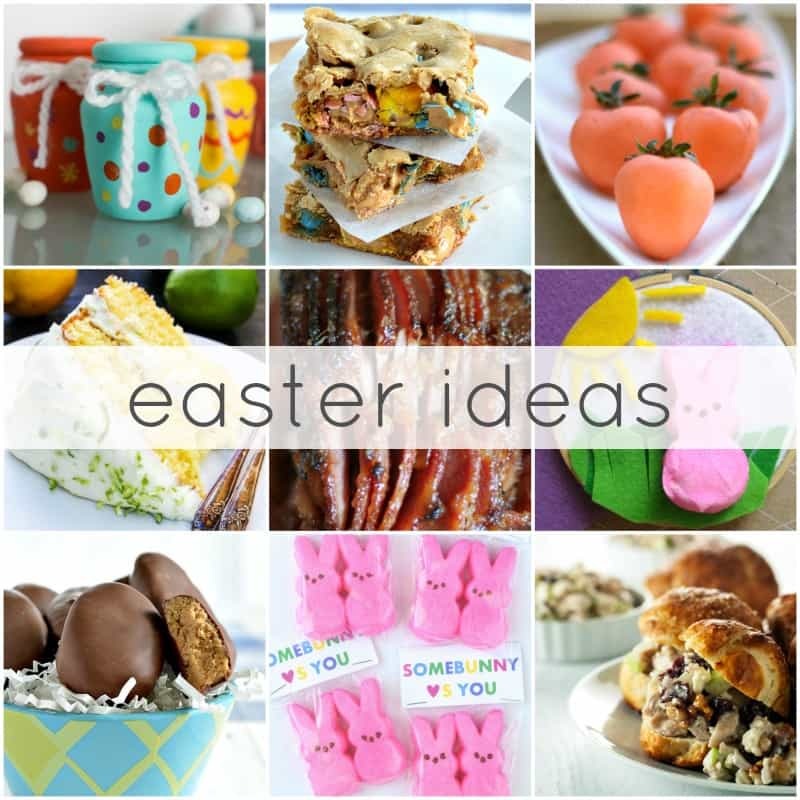 But, the DIY-er in me couldn’t stand it for too long. My sweet hubby planted some pretty flowers for me and raked in some black mulch, then I got to decorate! I decided to make pumpkin house numbers, and it’s super easy and cute for fall, so I thought I’d show you how to make them, too! 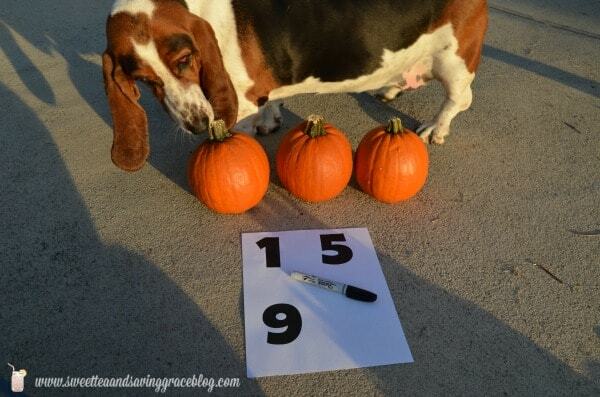 First, you get a fat basset hound named Daisy Mae, and let her sniff out some little pumpkins until she finds the perfect ones. 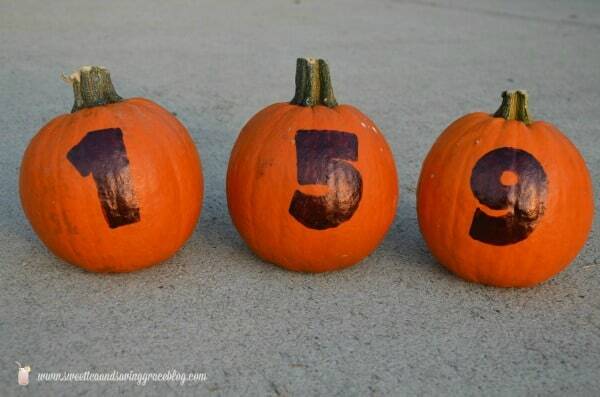 You’ll need one pumpkin per house number, so in my case, I got three. 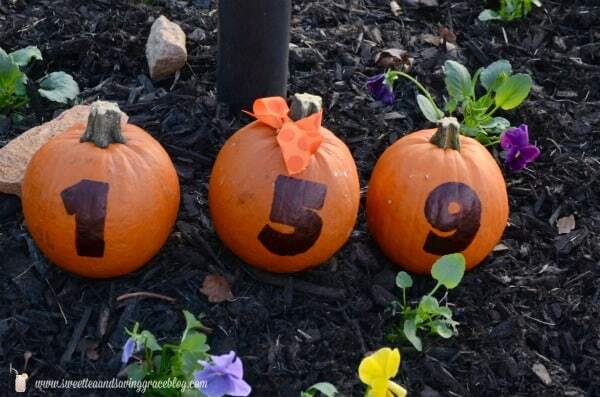 Then, I printed large numbers using Picmonkey, and cut them out to trace onto each pumpkin. 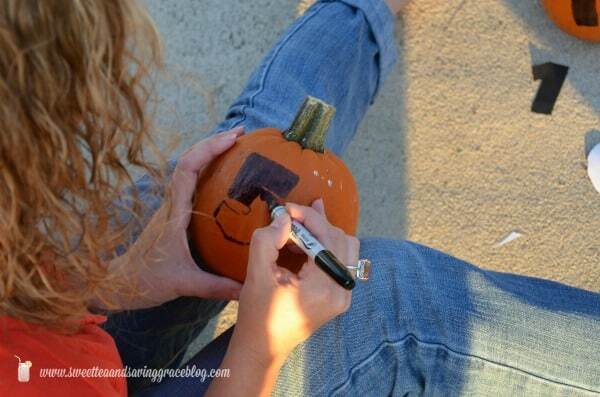 I used a fat felt tip Sharpie marker in black to fill in the numbers after tracing them onto the pumpkins. Cute, right? 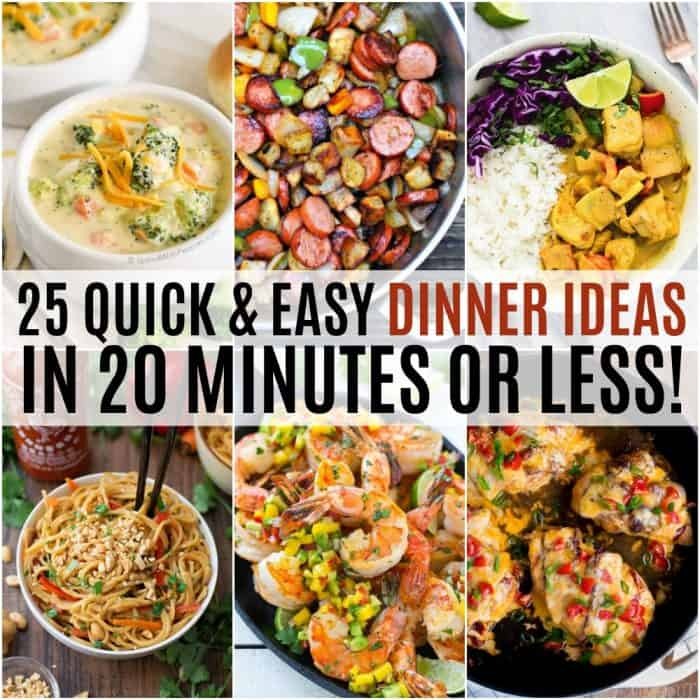 I thought so! After they were complete, I just placed them around my mailbox and tied a cute ribbon on the middle pumpkin for some flair! 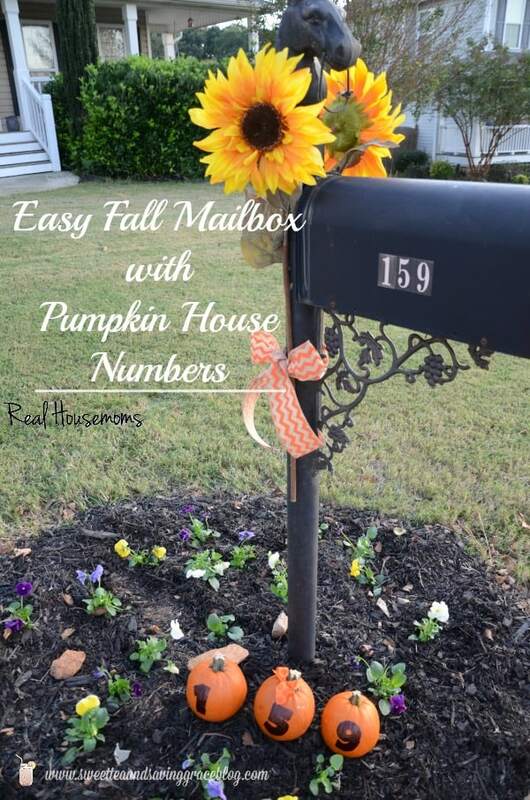 Easy peasy pumpkin house numbers! I dressed up my mailbox a bit, too. 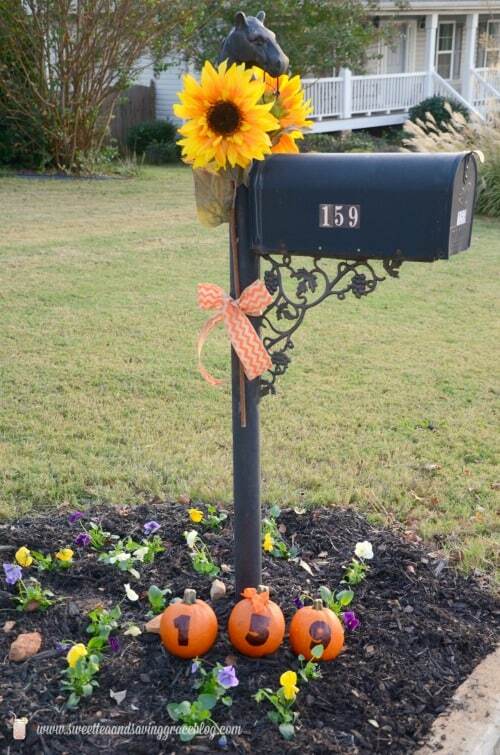 I found these huge artificial sunflowers for only $6 each, so I used floral wire to tie them to each side of the mailbox, then added burlap chevron ribbon to hide the floral wire. Now my home is ready for fall, inside and out!